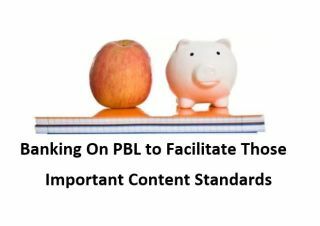 In this post, I would like to focus on the curricular content and standards that are one of the foundations of PBL. As I travel the country I will often hear teachers state that there is not the time for PBL because of the demands of the curricular content and standards. I understand this concern and the sincere desire that amazing teachers have in trying to prepare students for a successful future. I do wonder about the difference between knowing standards and understanding standards, but I will save that for a future post. First, I do agree that students do have the need to learn and understand base curriculum that focuses on important content standards. These are also those same skills that are many times tested on the standardized test, end of course assessment, and other high stake tests such as ACT, SAT, and AP. PBL, when done right, allows teachers to focus on and facilitate important content and standards. So what is PBL done right? Let’s take a moment to investigate and reflect. I have heard many interpretations of Project Based Learning. Often I hear a description that suggests that the teacher delivers the content and students follow up with an inspiring and engaging cumulative project. While this involves student doing a project, it really is not PBL. I call this teaching and then having students do a project. Resources from BIE (BUCK Institute) describe this as a “dessert project”. This comes from the idea that first there is the teaching… and then a sweet project for dessert. While this can be useful and can reinforce some learning it is not truly Project Based Learning. In fact, I would like to give this practice its own acronym, LBP (Learning Before Projects). I can understand how we as educators might not have time for this encore or dessert style or approach. PBL, however, is not an afterthought! In true Project Based Learning the project uncovers and facilitates the learning of significant content. In PBL, there is a balance of learning that occurs throughout the project’s duration. It is this combination that allows for quality and rigor while helping students see the connection of content to the real world. It is important to understand that the ongoing project itself, through careful teacher planning, must facilitate the learning. Furthermore, it is essential that a PBL unit is designed with proper scaffolding or mapping that includes both learning activities and effective ongoing assessment. In fact, some of these activities might actually be existing lessons that a teacher has always used. It is even possible and probable that part of the scaffold will include readings, lectures, and even a worksheet, although it is important to keep a balance using all of Bloom’s levels. While assessment is varied, there is nothing wrong with including a summative test. After all, our students will be facing these for awhile as they continue their educational careers. It is important to note that because the project is used as a base and point of reference throughout the learning, the element of time becomes much more productive than what might occur in LBP (Learning Before Projects). Through this process, the learning, understanding, and application of significant content standards will become an important outcome. PBL provides the rigor of learning new content along with the engagement apparent in a student-centered program based on deeper learning. The content becomes the “what” while PBL is the “how”. Below you will find twelve ideas to keep in mind in order to ensure that a PBL unit contains those important content standards. The entry event serves as a link bewtween student prior knowledge and what students are about to learn. Student inquiry in the project allows for motivation, engagement and ownership of the learning and the standards. The inquiry alloiws for the cycle of learning in the project. PBL shoud get students beyond the nouns in the standards allowing real life practice of those verbs that are also in the standards. The PBL map should include a wide range of Bloom’s levels and deeper learning opportunities. While digital technology can amplify the experience, it is not always neccessary. There should be rubrics developed that evaluate student learning outcomes and rubrics should be aligned with the significant content and student performance. Students and their peers should also be part of the evaluation process. The final project should not only emphasize the content standard verbs (21st century skills) but should show the learning and understanding of significant content at he highest levels. The final project should demonstrate student understanding and learning of the standards and content. At the same time it should provide an answer to the Driving /InvestigativeQuestion providing students the “why”. Since learning is embedded throughout the project, consider the number of standards when determining the length of the project. There should be a balance and productivity in the learning experience. Remind students the importance of learning about and understanding the content standards throughout the project. This can be facilitated by providing important formative and summative assessment that ensures accountability while connecting the learning to real life. The acquisition of content knowledge that has been deemed important by society is one of the key functions of education. Project Based Learning honors this by immersing students in the important content standards while providing that needed foundation. In a world that is seeing content multiply at an exponential rate, it is also important to help students become seekers of knowledge and lifetime self-learners. Along with those additional 21st century skills, PBL provides the avenue to both build the content foundation while activating the natural ability to learn.